I've only had one goal for my 26th birthday. Make deliriously good mac n' cheese. I succeeded. So. Much. Cheese. Which means I am slowly sinking into a food coma. I'm going to push through it though, because I need to share this cake recipe with the world. I tend to get real reflective and sappy around my birthday. Okay, I'm reflective and sappy all the time but I'm extra on my birthday. The process of making this cake actually encompassed a lot of my emotions about getting another year older. Let me ramble for a moment. To start, I'm going to state that I don't have a lot of experience decorating cakes. I've been practicing baking cakes for the last 7 months and I've definitely gotten better! But piping flowers and getting beautiful crumb coats are still very foreign to me... but I'm trying. I made this cake last Friday afternoon in preparation for Reuben's 30th birthday. I was stressed out about something silly in the office earlier that day and I couldn't shake my stress as I went home and began measuring out my flour and sugar. I was also trying to print some greeting cards for a Hey, K. Cho! shipment and my printer was jamming and just plain not working. The batter was thicker than I was used to and giving me hard time. Mid-mixing I had realized that I forgot to send a file at work. I was getting hot and flustered in the kitchen. I had to take a moment to just stop, lay in bed, and breathe for a few minutes. I relaxed and tried to clear my mind. I felt lighter. Reuben came home. I love Reuben so much and I immediately felt better. I was ready to get back in the kitchen and tackle this project. And you know what? Everything ended up being perfectly fine. I had visions of how I would decorate my cake but that didn't quite pan out. I piped cute dots inside and I still like it. The thick batter baked into a fluffy moist cake. I didn't have enough buttercream to get a thick layer all around and the coat wasn't super even, but the cake tasted incredible and too much frosting bothers me anyway. My printer started working again once I left it alone for an hour! The files I needed to be sent could wait to be sent on Monday morning. Hooray! Ever since the time I was like 16 I've had a problem of doing too many things. It's hard for me to just pick one thing or passion to focus on. There is just so much I enjoy doing and want to learn how to do. This has only intensified over the years. More so over the last year with starting this blog and working on calligraphy and illustrations. And I started a new job which has been scary and challenging in it's own way. It takes a lot to not turn into a ball of nerves. How do I not go crazy? I'm a firm believer in mental health and practicing being mindful of yourself and your needs. But what I really think helps hold me together through all the craziness is simply trusting in the universe. Does that sound too hippie dippie? It's hard explain, but I've always had a deep trust that the universe will work things out. Even when it gets real real bad, everything will start to make sense and feel good again. Yep, I got all of that from baking a cake! At age 26, I feel I am right where I am supposed to be. I'm trying to remind myself of this trust as much as I can and not stress so much. Just do you. My hope is that this trust only grows deeper as I get older and then one day I'll be one of those super cool, confident, and creative adults! My food coma is hitting me hard now. So I'm going to leave you with this cake recipe and 5 pieces of advice from a 26 year old. Oof, I need to eat some fruit. 3. Don't waste money on a lackluster lunch. 4. Remember to drink lots of water. 1. Preheat oven to 350 degrees. In a medium bowl, whisk together cake flour, baking powder, baking soda, and salt. Set aside. 2. Add the softened butter into the bowl of your stand mixer and beat until light and creamy. About 2 minutes. Gradually add in sugar and beat for another 3-5 minutes. Beat in vanilla and egg yolks until incorporated. 3. Continue beating the butter mixture on medium speed. Add 1/3 of flour mixture, beat a few seconds to incorporate, then add 1/2 of yogurt. Repeat until all the flour mixture and yogurt has been mixed in. 4. Beat the egg whites until stiff peaks form in a separate bowl with hand-held beaters. Or you could transfer the contents of your stand mixer bowl to another mixing bowl and clean your bowl and whisk attachment to whisk the egg whites. 5. Gently fold in egg whites in the cake batter. The batter is a little thick, so don't be afraid of putting a little muscle into mixing your egg whites in. 6. Spray cake pans with non stick spray and line bottoms with parchment paper. I trace and cut them out with a scissor. Divide the cake batter evenly in the pans. Use an small offset spatula to help spread and level the cake batter. Bake for 20-22 minutes until golden and test for doneness with a toothpick. Once done, allow to cool in the pans for 5 minutes. Carefully remove cakes from the pans and allow to completely cook on a wire rack. Use a knife to help loosen the edges of the cake. 7. Make your buttercream by beating softened butter in your stand mixer until light and creamy. Gradually add in powdered sugar and mix until fluffy, about 5 minutes. Add in tahini, ground black sesames, and salt. Beat for another 2 minutes. 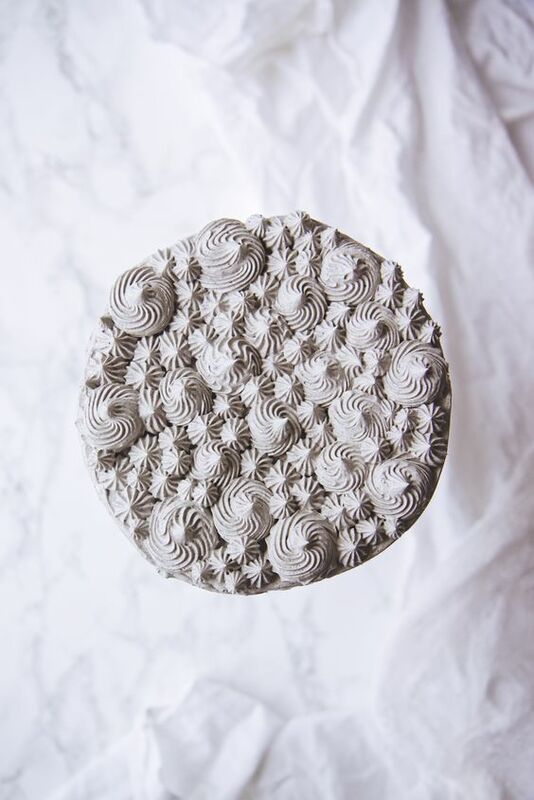 Transfer buttercream into a piping bag with a medium round tip if you're going to attempt to pipe some designs. 8. Start assembling the cake by layering buttercream on top of your first tier. Use an offset spatula to help level the buttercream. Add another a layer of cake and repeat until all layers are stack. Use a dough scraper to check if the edges are straight. Frost the entire cake with your remaining buttercream. Decorate with additional piping or extra black sesame seeds!